Jorge Lorenzo signed off at Yamaha by claiming victory at the final race of the season in Valencia. The Spaniard, who will move to Ducati for the 2017 season, enjoyed a dominant weekend, leading the race from start to finish. World Champion Marc Marquez finished second, whilst Andrea Iannone, who Lorenzo replaces at Ducati, rounded off the podium. Having broken the lap record in a blistering qualifying session, it was no surprise that Lorenzo started well. Within a few laps the Yamaha man had escaped the pack, leaving teammate Valentino Rossi to challenge with Maverick Vinales and Iannone for second place. Marc Marquez suffered from a poor start, getting swallowed up going in to the first corner, but put in a strong display to battle his way back up to second. With Lorenzo struggling in the final laps with his front tyre, it looked as though Marquez would be able to take a remarkable win. But the Repsol Honda rider left himself with too much to do, with Lorenzo taking the win by just over a second. Rossi got the better of his future teammate Vinales as they finished fourth and fifth respectively, and Pol Espargaro edged out both Andrea Dovizioso and his brother Aleix to finish sixth. Bradley Smith finished as the top Brit in ninth, on his final ride for the Tech3 Yamaha team. Scott Redding finished fourteenth with Eugene Laverty sixteenth. Cal Crutchlow remained the top independent rider of 2016 despite crashing out. Having already confirmed his second Moto2 title, Johann Zarco bid farewell to the class with another victory. Sam Lowes, who is also heading to MotoGP next season, came fourth whilst Danny Kent secured a ninth place finish. It was a similar story in Moto3, as the dominant Brad Binder recovered from an early mistake that saw him drop to 22nd to take the chequered flag. 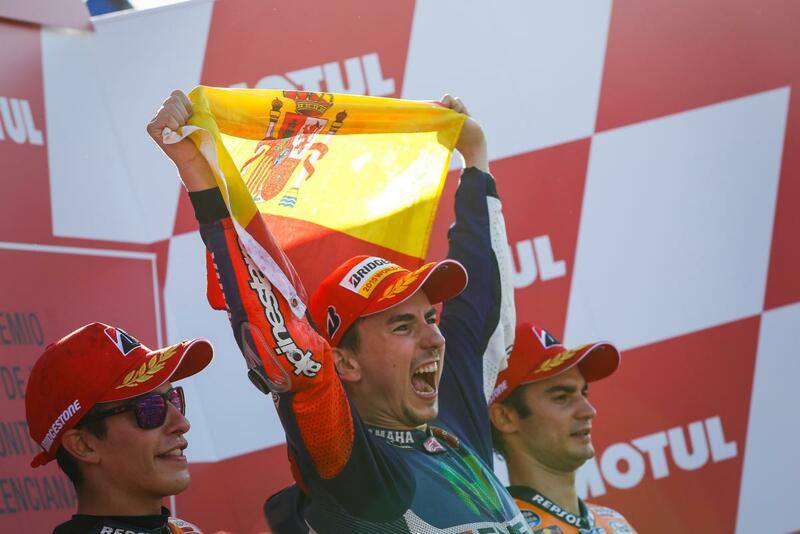 Jorge Lorenzo lifted his third MotoGP title after winning in Valencia. The result will be tainted by the ride of Marc Marquez, who looked to be riding to prevent Valentino Rossi from securing his tenth world championship. Marquez finished second, with team mate Dani Pedrosa in third. Rossi, who had to start from the back, came fourth, but lacked the pace to catch the front three. Lorenzo led the race from start to finish after his immense lap in qualifying, and you really can’t take anything away from him with how he rode. During the run in, he has kept his head down and continued to race in his own smooth style. For the first half of the race in Valencia, he looked to do the same, but in the final twelve laps Marquez caught him. Marquez rode comfortably behind Lorenzo, looking as if he could pass him comfortably if he wanted to. 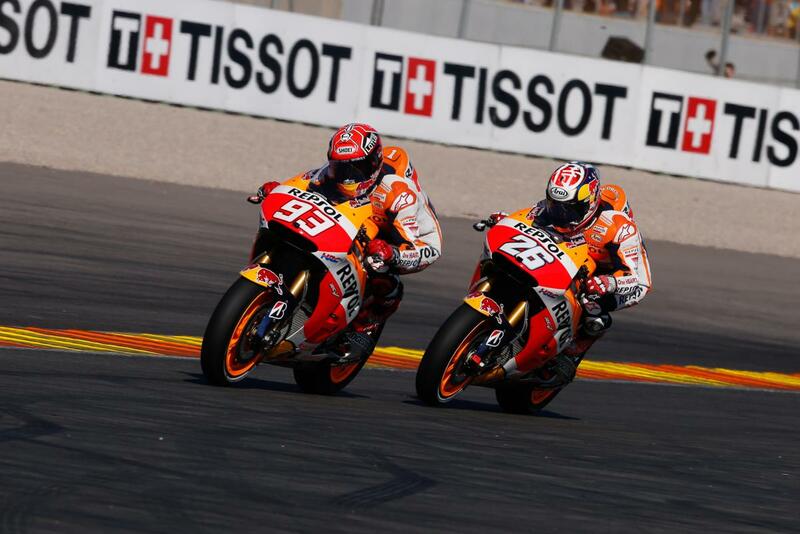 The two had stretched a 2.5 second gap back to third placed Pedrosa, giving Lorenzo the comfort of the top two finish he needed. During this time, Rossi made his way through the pack, overtaking 11 riders in the first lap. He reached fourth with 18 laps remaining, having only been held up very briefly by Danilo Petrucci and the Espargaro brothers, but he was unable to bridge the 11 second gap to Pedrosa. The title looked done and dusted until, with six laps to go, Dani Pedrosa smelt blood. The Honda rider chipped away at the gap to his team mate, in what looked like a repeat of his performance in Motegi. By the penultimate lap, he was right with the top two, and the pendulum started to swing back in Rossi’s favour. Pedrosa’s pass on Marquez shook the two-time world champion out of his lethargic ride, as he hit bit back at Pedrosa immediately. The battle between the Repsol Honda riders gave Lorenzo breathing space and completely knocked the momentum out of Pedrosa’s charge. You have to wonder whether in the same situation earlier in the season, would Marquez have let his team mate past and attempted to follow Pedrosa when he made a move for the lead? Who knows, but one thing is for certain, Valentino Rossi can only blame himself. He buckled under the pressure in Sepang, lashing out as Marquez provoked him with a series of hard but (barely) legal passes, landing himself in the position of a points deduction and a grid place penalty for the final race. For a man of his experience, you would expect him to keep his cool. Away from the controversy at the top, Pol Espargaro and Bradley Smith came fifth and sixth, with Andrea Dovizioso in seventh. Aleix Espargaro came eighth, and Cal Crutchlow, who started from the back due to mechanical issues before the race, finished ninth, ahead of Petrucci. Scott Redding came fifteenth, and Hector Barbera finished as the top Open class bike in sixteenth, one place ahead of the retiring Nicky Hayden. Britain saw its first grand prix champion in 38 years as Danny Kent secured the Moto3 championship. Kent needed two points (14th place) to secure the title, and came home in ninth thanks to a last corner collision involving Vazquez, Fenati and Antonelli, who were in second, third and fourth at the time. His title rival Miguel Oliveira did all he could, winning the race to end a thrilling season of Moto3. Tito Rabat won the Moto2 race to secure his third place in the championship. Sam Lowes’ fifth sees him consolidate fourth spot, with title winner Johann Zarco finishing seventh.